My favourite part of Eco Fashion Week is always the Value Village runway shows. Their 81 Pound Challenge aims to bring awareness to the amount of clothing waste we make each year, and shows just what can be done with that waste through upcycling! Every year, the average person throws away 81 pounds of textiles. That's a massive amount! The really concerning part is that just a few years ago, it used to be called the 68 Pound Challenge, but new statistics have been released since then showing that number has continued to rise. Evan Biddell, the winner of Project Runway Canada Season 1 was the designer tasked with creating an entire runway show from the 81 pounds of clothes this year. Take a look below to see his incredible eco-friendly creations! I've included photos from the Toronto Women's Fashion Week runway show from earlier this year, since Vancouver's showcase did not include a full runway show of Evan's collection. 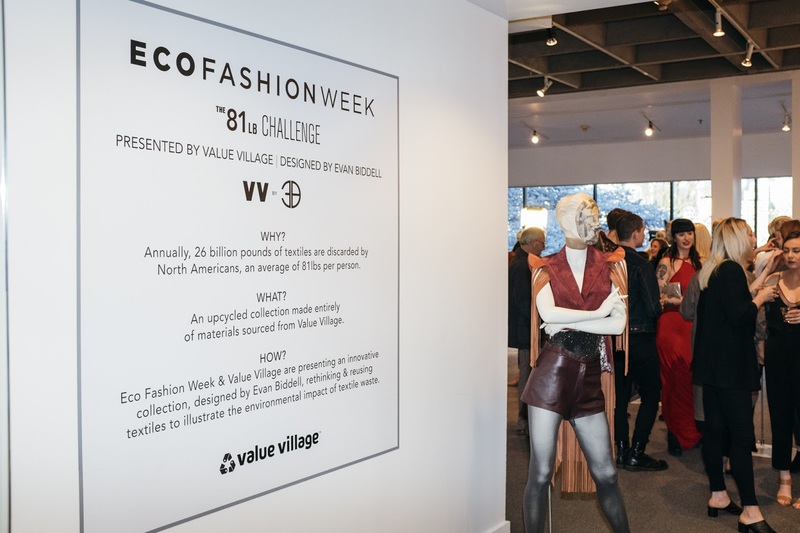 Instead, Eco Fashion Week displayed the 81 Pound Challenge in a unique setting at the Museum of Vancouver, which allowed guests to get up close and personal with each piece, to see how it was constructed! Isn't it inspiring to see what he was able to create with all those old garments? While at Eco Fashion Week this year, I was very grateful to have the opportunity to share my eco-friendly thrifting hacks with ET Canada's host Erin Cebula, as part of their coverage of Eco Fashion Week in Vancouver. Click to watch the video below, and maybe you'll pick up a few tips for the next time you're thrifting at Value Village! Again, I also wanted to show my Eco Fashion Week outfit, entired thrifted from my favourite thrift stores, Value Village and Salvation Army. All the details are below!